The budget is “back in the black” Treasurer Josh Frydenberg crowed as he delivered the Coalition’s budget in Parliament on Tuesday night, April 2. His speech was worthy of a best actor award. It was noteworthy for its deception and lies, presenting the key issue as building a budget surplus while falsely claiming that its planned tax cuts would benefit those on low and middle incomes. 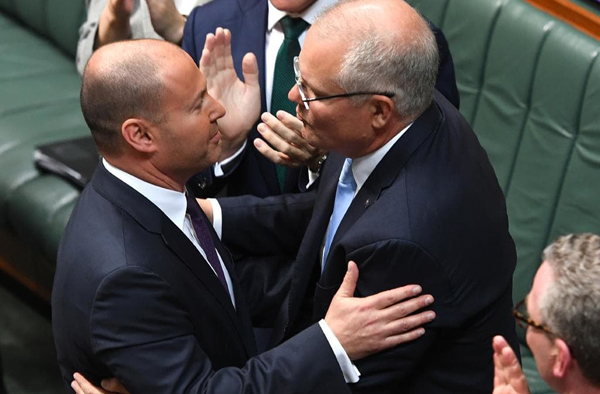 Last waltz – Treasurer Josh Frydenberg and PM Morrison. The most important feature of this budget is not the surplus or sound economic management, but lining the pockets of the corporate sector and the rich. As with past budgets, those with the greatest wealth get the most and the poorer, most vulnerable, are expected to wait for a few crumbs to trickle down. They never do. The Treasurer’s speech is littered with references to those who in his eyes do not deserve a hand up or support from the state. “Our plan is shaped by our values. “And our values embrace all Australians. Not just some of them. “The power of aspiration and enterprise. It is loaded with dog whistles, attempting to justify the punitive treatment of the unemployed, the sick, those with a disability, carers, and women on low incomes in casual or precarious jobs. These women have been forced off benefits and back into the workforce. As for childcare, the government did not show any interest. Despite all the calls from business organisations, charities, advocacy and other groups the government yet again refuses to increase the NewStart payment of $277.85 a week. That is just under $40 a day. It opposes the ACTU’s living wage claim and Frydenberg has admitted that the government has deliberately kept wages low. People With Disability Australia noted that the federal government spent $3.8 billion less on the NDIS in 2018-19 than was allocated in last year’s budget. The government has defended the NDIS under-spend, arguing that funding is based on supply and demand and will be available when more people transition into the scheme. That doesn’t wash with people in the system who have had their services cut back or have been waiting two years for essential equipment. It would appear that under-spending has been propping up budgets. “So tonight, I am pleased to announce a budget surplus of $7.1 billion.” Really! A look at the budget papers reveals that the government is forecasting a deficit of $4.1 billion for 2018-19. That doesn’t rate a mention in his speech: $7.1 billion refers to a forecast for the following financial year. It has a familiar ring to it. In 2012 Joe Hockey promised to deliver a surplus for every year of the Coalition’s first term. In true Trump style, Frydenberg didn’t let this year’s forecast of a $4.1 billion deficit get in the way of election campaigning. After all, its forecast of a $7.1 billion surplus in 2019-2020 was a very convenient figure in a pre-election budget. What’s more it has been done “without increasing taxes” and we were reminded of this nine times just in case you missed it the first time in his 40-minute spin. Taking another leaf out of the Trump political campaigning book, Frydenberg made 19 references to the economy being stronger with the Coalition. “We are reducing the debt and this interest bill,” Frydenberg claimed. Really? The Coalition promised to reduce the debt but in reality it has risen with each new budget deficit. Since the Coalition came to office, the ratio of public debt, accumulated from budget deficit to GDP has risen by a third. “This government has been at the forefront of global efforts to crack down on multinational tax avoidance,” Frydenberg claims. Once again, nonsense! So its first action was to slash the Australian Taxation Office which resulted in the sacking of 4,400 staff. Not surprisingly, tax avoidance has rocketed under the Coalition government. Frydenberg paints a rosy picture of Australia’s economic future and then in the next sentence points to a slowing global economy, cost of living pressures, and “serious challenges” ahead. Frydenberg’s forecasts of wage and economic growth are just as questionable as those of this predecessor. The government supported the cuts to penalty rates and has no intention of supporting the ACTU’s claim for a living wage. There are massive tax cuts on the horizon, all “without increasing taxes”. A total of $158 billion over the coming 10 years, in addition to the $144 billion of cuts legislated for last year. That is a total of more than $300 billion! The biggest cuts are in later years. 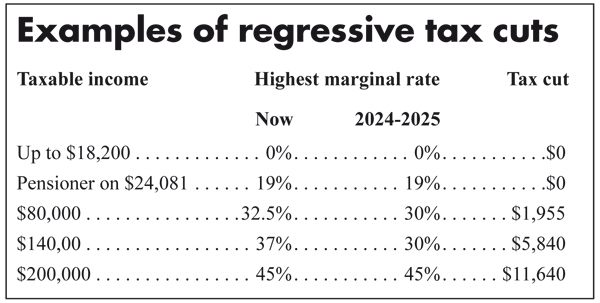 Taxpayers with taxable incomes of between $45,000 and $180,000 will see their top marginal rate reduced from 32.5 or 47 to 30 cents in the dollar from July 1, 2024. “Following these changes, our tax system will remain highly progressive.” That is another porky. If they go ahead Australia will have taken a huge leap towards a regressive flat tax. There is nothing progressive about a tax system that gives the bottom 20 percent three percent of the cuts and the top 20 percent get 54 percent of the cuts. The Treasurer also tries to sell these tax cuts as increasing the wages of low and middle-income workers, although it’s a bit of a stretch of the imagination to call $180,000 a middle income. Firstly, tax cuts are not the same as a wage rise. They amount to a subsidy for employers so that they do not have to eat into their sacred profits to provide workers with a living wage. They rob the public purse of money that could and should have been spent on services. It remains to be seen whether the Fair Work Commission takes these into consideration when calculating a wage rise for workers at the forthcoming Annual Minimum Wage Review. Consistent with its neo-liberal economic policies, the government’s income taxes are skewed in favour of the rich. So much so that anyone on an income below $18,2001 – the tax-free threshold – gets nothing. These cuts if enacted serve to entrench and deepen inequality. Job Search payments are a maximum of $14,448, well within the tax-free threshold. A pensioner on $24,041 stands to gain nothing with the bottom threshold remaining at 19 percent and still kicking in at $18,201. So pensioners, the unemployed, carers, people with a disability and others relying on social security payments miss out yet again. The existing “low and middle income tax offset” for taxpayers with a taxable income of up to $126,000 will be increased to a maximum of $1,080 for single income families and $2,160 for families on a dual income. In addition, the low income tax offset for those on taxable income will receive up to $700. Again, if you have an income which is below the tax threshold, then you also miss out on this payment. This payment is set to be offset against 2018-19 taxable income. Amongst the other budget items there is a promise to lift the freeze on Medicare rebates, but so far no indication by how much. The health measures for the treatment of cancer are an important step forward but should be applied across the board for all illnesses and dental health. As was to be expected the environment came a poor last in priorities. The infrastructure projects focus on marginal seats.